“Digital health has great potential towards reducing inequity in provisioning and distribution of healthcare resources and services and it can greatly facilitate proactive treatment for disabled patients, children with developmental delays and deformities and people suffering from mental health illnesses and for those suffering from stigmatic infections such as HIV/AIDS, leprosy and tuberculosis.” This was stated by Shri J P Nadda, Union Minister for Health and Family Welfare during his address at the Global Digital Health Partnership Symposium at Sydney, Australia, today. The Union Health Minister spoke on the topic: The role of digital health in supporting improved health outcomes in India. Mr. Michael Keenan, Minister of Human Services, Australia, Mr Jim Birch AM, Chair, Australian Digital Health Agency, Professor Robyn Norton, Co-founder and Principal Director of the George Institute for Global Health, Professor Ian Jacobs, President and Vice-Chancellor, UNSW Sydney, along with delegates from other countries were also present at the event. 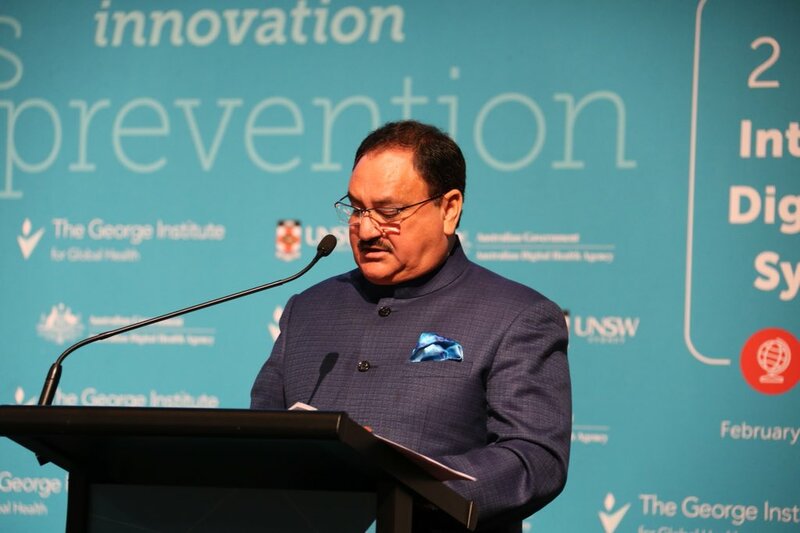 Addressing the participants, Shri Nadda said that it is evident from experiences of various countries that well-designed digital health systems and services can reduce medical errors and cost of care while improving health system efficiency. “We have seen many sectors benefitting from digital revolutions in the past such as retail, banking, logistics etc. The next decade of digital revolution is going to be seen in healthcare; in fact, digital revolution is long overdue in healthcare which can transform the way our physicians, nurses, field staff and hospitals work to deliver care,” Shri Nadda stated. The Union Health Minister informed the participants that the National Health Policy (2017) of India clearly articulates the healthcare aspirations of people of India with three distinct goals. “The first goal is to ensure district-level electronic database of information on health system components by 2020, which largely means moving away from paper-based data collection and recording in public health system to use of sophisticated computerized tools for improving functioning of hospitals and health system. The second goal is to strengthen the health surveillance system and establish registries for diseases of public health importance by 2020, where we intend to create registries to support epidemiological profiling of diseases to be better informed for targeted health interventions. The third goal pushes us to work for establishment of federated national e-health architecture, setting-up of health information exchanges and national Health Information Network by 2025,” Shri Nadda elaborated. Speaking about various strategic initiatives taken by the Union Health Ministry, Shri Nadda said that Integrated Health Information Platform (IHIP) is intended to establish first Health Information Exchange by connecting various Hospital Information Systems from 10 Indian States. He also highlighted the work done by the Ministry in building Registries. “We have started building registries for health facility and have given unique identification numbers to more than 200 thousand public health facilities. Incorporation of health facilities from private sector is ongoing. Creation of registries for patients and providers is also planned to be taken-up under IHIP,” Shri Nadda added. The Union Health Minister further said that the Health Ministry is in process of setting-up a National Digital Health Authority, a statutory body for creating frameworks, regulations and guidelines for interoperability and exchange of digital information. The Authority is also intended to promote adoption of eHealth standards. It will soon be set up through an Act of Parliament which would also address issues related to health data privacy and security. Shri Nadda also gave an overview of Health Data and Information Standards and Tele-medicine. Reiterating India’s commitment towards Digital Health, Shri Nadda said that modernization of healthcare through digital technology is an important public policy agenda and India is committed to modernizing its health facilities and services using digital technology. 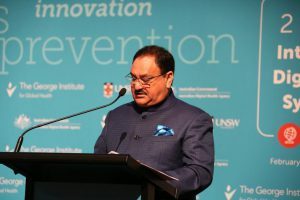 “Under the Digital India Programme of Government of India, we are giving lot of focus on use of ICTs for improving service delivery and Health Ministry has rolled out large scale IT systems in different areas of healthcare ecosystem such as public health management, hospital information system, supply chain management, online services, tele-medicine, programme monitoring, mHealth etc,” Shri Nadda stated. Stressing on the need of building collaborations, the Union Health Minister said that cyber security and protection of privacy of patient health data are major areas where cooperation from various countries would be required. “This area also requires collaboration with industry and academia to come-up with sustainable strategies to fight cybercrime. Similar collaborations would also be required when we intend to use Artificial Intelligence and Machine Learning in hospitals or in community settings for use by health workers,” Shri Nadda said.